Want to take your Easter egg decorating to the next level? Hop to it with these awesome ideas that we collected from around the web. Just keep in mind that using paint and some other craft supplies to decorate your eggs will render them unsafe for consumption. They may also be too pretty to hide in your yard. These eggs couldn’t be any cuter! Yellow paint (or dye), a tuft of feathers, and a face made of craft paper or washi tape is all it takes to transform your plain white eggs into adorable baby chicks. To make a chicken coop display, simply use the original egg carton, tucking in some faux green grass. These dyed eggs are so easy! All you’ll need is some Tupperware bowls, long grain rice, and food coloring. Fill a bowl with ¼ cup rice, and 5-6 generous drops of food coloring, then put the lid on; shake vigorously to mix. Hard-boil your eggs, and once cooled, place in the bowl. Cover and shake to coat the egg with the food coloring – remove and let dry. You can use as many colors as you’d like. These glitzy eggs make the perfect table centerpiece. First, hard-boil or hollow out your eggs, and dye them using traditional techniques (you can also paint them). Once dried, apply a thin coat of mod podge to one side of the egg, then sprinkle confetti over the mod podge until its covered. Let dry completely before displaying. This is an all-natural alternative to decorating eggs. You’ll need a head of red cabbage, 4 teaspoons white vinegar, edible metallic gold paint, and a thick bristle paintbrush. You will be using the red cabbage, boiled, to dye your eggs different shades of robin’s egg blue. Splatter them with edible gold paint for gorgeous results. Makes one dozen eggs. 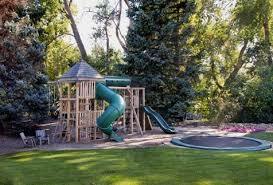 Want a kid friendly backyard? One where they can burn off all their extra energy? All you need is a little imagination and the right tools to design your outdoor space to meet all of your landscaping needs and wants. 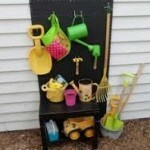 A kid friendly backyard, however, doesn’t mean you have to give up on making it attractive for you and your guests. Play structures, such as backyard swing sets and clubhouses, can provide you with time to relax as your children spend hours entertaining themselves. Kids can spend hours playing on the monkey bars, hanging out in the clubhouse with only their imagination, or simply swinging on the swings. Sand provides one of the best time snatchers. Before you know it you’ll be calling your little ones in for dinner; well that is of course; if you’re not already out there with them. 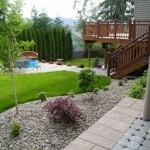 You can make your own backyard beach by dedicating a portion of your yard or opting to purchase a traditional sandbox. Avoid hard solid surfaces as well as cactus or other plants that can harm your kids should they accidentally collide with one of them. Grass is a preferable play surface for kids of all ages. 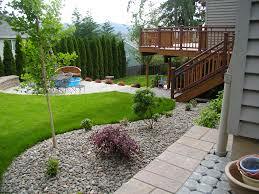 Grass additionally requires very little maintenance. If you have a play structure, the Consumer Product Safety Commission recommends placing shock-absorbing materials, at minimum 6 feet out from the play structure on both sides. These materials include wood mulch or rubber. If you’d like to try these ideas, or any other idea, for designing your own kid friendly backyard please feel free to contact the professional designers at Elite Landscaping and Sprinkler Repair at (602) 390-4645. We can develop a design that meets the needs of your family!